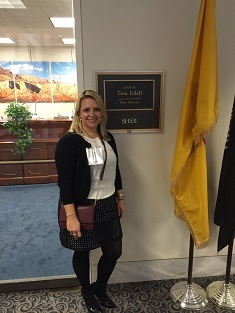 2015 - Advocacy in D.C.
New Mexico's own April Lynch was on hand in Washington D.C. for National HIT Week and performed needed advocacy with our State's representatives. Background Statement Patients and providers need interoperable health IT tools to ensure the right information is available at the right time to make better health and healthcare-related decisions. Such tools help facilities and providers gather and transmit necessary data to improve the delivery of healthcare, achieve better health outcomes, reduce costs, and address public health needs. HIMSS supports actions in Congress to synchronize national efforts to advance interoperability. Direct HHS to review and amend the ONC Health IT Certification Program to include rigorous interoperability testing (or leverage private sector-led testing programs) to ensure consistent implementation of HIE standards and specifications in certified EHR products. ONC’s Program does not currently include robust testing to ensure certified EHRs are capable of sending, receiving, and incorporating data. Requiring consistent implementation of HIE standards is necessary to ensure certified EHR products are able to exchange information needed to inform care decisions. As emphasized in Meaningful Use Stage 2, adopting health IT tools that enable the exchange of relevant clinical and business information needed to inform care decisions. are essential components of the nation’s healthcare transformation strategy. Remove the Congressional prohibition (levied on HHS annually since 1999) on the use of federal funds for the development of a unique patient identifier standard. Direct HHS to study a nationwide patient matching strategy. Such a study must include: the benefits and implications of applying a nationwide strategy; the safety risks associated with NOT having a nationwide strategy; the impact on privacy, security, and safety of a nationwide strategy; and, current and near-term best practices and technological solutions. Ensuring the accurate, timely, and efficient matching of patients with their data across different systems and settings of care is critical to enhancing the safe and secure e-exchange of health information. Patient-data mismatches remain a significant problem. If we do not address differences in systems, matching algorithms, and data dictionaries, mismatches will increase as entities engage in greater health information exchange. Direct all federally-funded national and state government agencies to have the functionality to exchange data with healthcare institutions through means of standard language interfaces, e-data exchange, and health information exchanges. Require a study on the barriers to e-data exchange with federal/state agencies and the subsequent cost/quality impact incurred due to a lack of uniformity of data exchange. Direct HHS to provide a three-year roadmap based upon findings from the study whereby all federal and state entities receiving federal funds are able to e-exchange data. The HHS Secretary is to provide annual updates. Healthcare, a critical infrastructure sector in the United States, requires meaningful, secure e-exchange of health information to improve health, provide better care, and lower costs. Healthcare providers and organizations must be equipped to defend against growing cyber threats using a consistent and effectively-implemented data security framework. 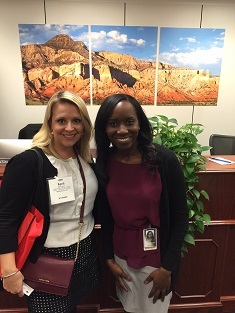 HIMSS supports efforts in the House and Senate to advance information sharing legislation. H.R. 1560, the Protecting Cyber Networks Act (PCNA), and H.R. 1731, the National Cybersecurity Protection Advancement Act (NCPAA) of 2015 were passed by the House in April and S. 754, the Cybersecurity Information Sharing Act (CISA) of 2015 was passed by the Senate Select Committee on Intelligence in March and brought to the Senate floor to begin consideration in August. These bills are a positive step; but, given the unique characteristics of the healthcare sector, we encourage Congress to further explore policies to ensure the information is actionable, timely and accessible to all healthcare organizations. Consistently updated and applicable to the range of healthcare organizations. Create a single information sharing pipeline of actionable cyber threat intelligence from the government to the private sector in (near) real time, through a no-cost mechanism. a. Congress should direct a study on the most appropriate policies and procedures for Federal agencies to adopt and implement for transfer of cyber threat intelligence to the private sector such that the information may be shared in real time or near real time with healthcare organizations. The study should assess which Federal agency or other entity may be best suited to be the central conduit to facilitate the cyber threat intelligence information sharing. Telehealth services, and the technology that supports them, can expand access to higher quality care for underserved communities (both urban and rural), address provider shortages, facilitate proactive disease prevention and chronic care management, and improve patient and provider satisfaction. Current law prevents CMS from reimbursing most providers and health systems for Telehealth services and remote patient monitoring. HIMSS urges Congress to amend current law, and take steps to require CMS to remove barriers to deployment, and encourage broader types of technologies that will improve access and quality, and reduce cost. Amend the allowable originating sites of care beyond those currently stipulated by CMS to include interactions with patients from wherever the patient is located, including the home, where cost-effective and clinically-appropriate. Eliminate the geographic restrictions on Telehealth (i.e., currently not allowed in metropolitan statistical areas. Currently open only to Health Professional Shortage Areas). Allow expanded use of “store and forward capability” to aid long-term passive monitoring of chronic diseases (i.e., currently, only Alaska and Hawaii may use for federal demonstration projects). Expand modalities beyond live (real-time) voice and video to active monitoring between clinicians, patients and care providers (i.e., Asynchronous vs. Synchronous). Update Current Procedural Terminology (CPT) and Healthcare Common Procedure Coding System (HCPCS) to cover in-home monitoring or clinician/patient non-centralized exchanges, including shared decision making. Encourage nationwide efforts to harmonize federal and state efforts to address the challenges of licensing clinicians to serve patients across traditional state boundaries.